In its endeavor to enhance Email experience while on move India’s 5th largest GSM Mobile Service operator Aircel today introduced a new specially tailored device dubbed as “Peek”. 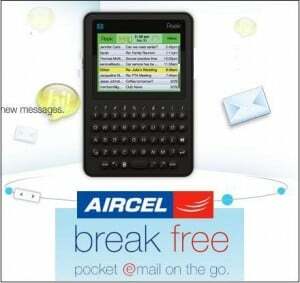 Peek is a low cost email device brought by Aircel which has email as the centre of all features.The devices is being offered at price point of Rs.2999 and it comes with a plethora of features built around Email. The Device is available Aircel stores, Croma, E-Zone or Staples stores. With this device one can set up multiple accounts in a matter of few seconds overcoming any complicated settings unlike other devices. Push mail delivers new emails to your Inbox automatically. Users notified of a new email in 3 ways like the blinking envelope indicator on the top left, a vibrate alert, and a sound alert. It also supports Microsoft Exchange MS Word, Excel and PDF etc and come with QWERTY keypad. According to the operator Peek comes with Remarkable battery life measure battery life by days – not hours. Its battery lasts for 2 to 3 days for an average email user. Prepaid plans-:On prepaid offers, get unlimited email service for Rs. 897 for 90 days. After the initial 90 days, subscriber can recharge with Rs. 89 for 7 days validity or with Rs. 299 for 30 days validity. Postpaid plans-:On postpaid, pay Rs. 897 for three months of unlimited email service, after three months rental of Rs. 299 per month will be charged. It’s time to say Goodbye to those complicated email settings on your phone. With Aircel Peek you just enter your login details, and within 60 seconds, you’re all set!